Taking a cross country trip. Everyone has their own opinion. If you've never done this before, this might help. If you have already done a long trip or two, then you probably already have your own list. Also see BamaRider.com. He's a bit more into camping than I am - I sleep in a motel at least every other night, probably four nights out of five on average. Here is a checklist to help you make up your own list of what you wish to bring. These ideas are for people who are travelling on a budget. If you make $350,000 per year or more, all you need is your bike and your American Express card. Don't leave home without it. 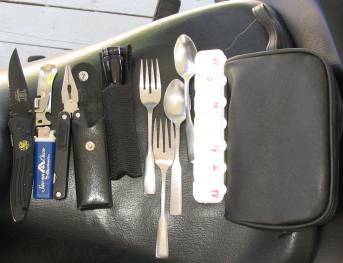 In my left glove box, I have a small pack with a good pocket knife, a folding multi-tool pliers, a couple spoons and forks, a camping can opener, a weekly pill container, a cigarette lighter and a small metal flashlight. Big 5 sporting goods sells most of this stuff at really good prices if you watch for a sale. The weekly pill container holds aspirin, acetaminophen (Tylenol), ibuprofen (Advil), antihistamine (Allegra), cold tablets (Aleve / Sudafed), caffeine, and melatonin. Long's drugs gives away the pill containers for free. A small camera bag holds a digital camera and spare batteries and flash ram. A small portable tripod. 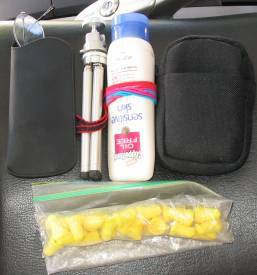 A zip-lock baggy holds 10 pair of spare earplugs. Ask around, everyone who rides long distances wears foam earplugs. Reading glasses (I'm not young anymore, I can't read a map without them). Sun block. A few hair bands wrapped around the sun block tube. In my right glove box, I keep a small pair of binoculars, a couple pens, a mini 10' tape measure, a tire pressure gauge, light weight gloves (gloves in a glove box, who's ever heard of such a thing?) and a mini-windex. Go to Wal-Mart or your favorite drug store; they will have a travel section with little mini everythings. There will be a bag of empty bottles, and if you get the right set one of the bottles will be a 4" high 1" diameter spray bottle. Fill this with windex. Use the other empty bottles in your bathroom kit. My tank bag holds my cell phone and the wiring to recharge it. Two liters of water. Several breakfast bars. A couple small bungee cords. Rand-McNally small road atlas. Local maps as required. Lunch for the day. If there's any chance of the temperature dropping below 70° I keep a sweatshirt in there. I like to alternate between USC and UCLA just to confuse my friends. I pack extra tools. 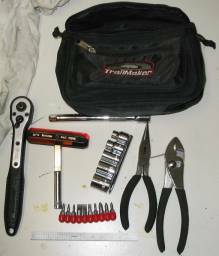 I have a small cordura pouch holding a 3/8" rachet, 6" extension, and 8, 10, 12, 14, 17mm sockets. A Hunter screwdriver with interchangeable bits and a folding T-handle - for me this works as well as an impact driver. Standard and needle nose pliers. A spare set of combination 8, 10, 12, 14, 17mm wrenches. Spare fuses. 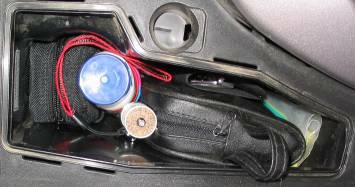 I pack the pouch under my passenger seat with a roll of electrical tape and an oil filter wrench that fits my rachet. I use these tools about once a year, but on those occasions nothing else will do. I don't carry a first aid kit. I consider that this is probably the single biggest weakness in my packing. I haven't yet thought about what I want to carry, and the commercial first aid kits I've seen are either huge or useless. What you need if you fall off your motorcycle in the middle of nowhere is very different from what they give you. With a little effort, you can get an adaptor for your cell phone and laptop so that you can connect to the internet while you're in your tent. Don't do it. It's a couple hundred dollars, the connections are typically 4800 baud (very slow), and it's wrong. When you're travelling thousands of miles from home on your motorcycle, you must guard your karma. Some riders have been known to carry portable TVs. This lets you watch the weather in the evening. If you watch anything else, you are going to spend a lot of extra time in purgatory. Bring a book. Only 7% of all Americans read a book last year; less than 40% of all Americans will ever read a book in their entire lives. Bill Gates read the entire Encyclopaedia Britannica in High School, and he's worth $100 billion now. Essentially every town in the US has a library, and essentially every library has computers on the internet that you can use for free. Weather.com will show you radar maps. If you use Hotmail or Netscape mail, you can read and send email. If you have a pop account, ask your ISP if they support webmail, like with SquirrelMail. This will let you read and send on the road. It's a good idea to have a personal web page with your favorite links and your email address book, that way where ever you go, there you are. Sign up for an account with OneSuite.com. You put $20 on deposit with them, and then anywhere in the country from any phone you call their 800 number, and then dial whoever you want for 2.9 cents a minute. Use your expensive cell phone minutes for short calls, if you're going to talk a long time find a land line. Remember, when you're on the road, unless you have a nationwide plan, you're roaming. Roaming means you're spending 50¢ to 70¢ per minute to use your phone. If you already have a cell phone, you can call your service provider and get your plan changed from a local plan to a nationwide plan for the month you'll be travelling. This will save you serious money on roaming charges. When you get home you can switch back to local to get the increased minutes. If you don't have a cell phone and want one just for your trip, you can get something relatively inexpensively. A "normal" cell phone requires a 1 year contract, typically for about $40 - $50 per month, so this is a $500 to $600 cost. Tracfone will sell you a reconditioned phone and a plan which is good for 60 days and 100 minutes (50 minutes if you're roaming, and you will be) for about $30. You can buy more access time and minutes later if you like. Or, find a friend who has an old cell phone that they no longer use, and ask them for it. This phone will most likely have a dead battery, and only reliably work when plugged into 12 volts - if your bike battery is dead, the phone likely won't work. The old phone is also likely analog, which means reduced coverage areas these days. If the phone turns on, it will respond to 911 whether it's activated or not - by law, the service providers must supply 911 coverage for any cell phone for free. You can call the original service provider on the phone, and most likely they will activate the phone for a pay-as-you-go plan. You buy an airtime card for about $10 - $50, and get about 15 to 90 minutes of roaming service, good for about 90 days. This idea sounds neat because of the free phone thing, but it's actually not so great: there's a good reason why your friend quit using his old phone. These days cell phones work in all cities with populations over about 1000 and on all interstates. However, west of the Rockies, if you're on county roads away from a city, it's unlikely you'll have service. AT&T Wireless has an only slightly optimistic map that you can use to see national coverage for phones. The best deals on cell phones are available on-line at LetsTalk.com. LetsTalk also has a great plan / phone comparison tool. Hint: pick your service plan, then your provider, then pick your phone last. There are basically two service plans available: a local plan, where you get several hundred minutes of anytime use and unlimited nights and weekends, but you pay roaming charges if you're more than about 75 miles from home. Or, a national plan, where you get a few hundred minutes of anytime use and unlimited nights and weekends, and there's never roaming or long distance charges. If you also want text messaging, pictures, or fancy ring tones and games, your monthly bill is going to go up quickly. Be careful if you get a family plan with shared minutes and have a teenager	- they can trivially spend $250 in a month on optional extras. GPS units are becoming more and more popular. I don't use one. These are good for getting un-lost, for finding basic services like gas stations, and for simple route planning. Currently (11/04) the Garmin StreetPilot is the most popular unit for motorcycling. About $850 - $1100, depending on how much software you buy. Also popular are the Magellan Meridian hand-held units, about $150 - $400. FRS radios have lately become very cheap, so it's well under $100 to get a bike-to-bike radio communicator. All the FRS radios are compatible with each other - you don't have to worry about brands. I have a NADY. I never use it. Turns out when I'm on vacation, I mostly don't want to talk to other people.